Team D.C. - Georgetown: Henry Sims, Jason Clark, Austin Freeman, and Chris Wright Maryland: John Gilchrist and James Gist George Mason: Folarin Campbell, Jai Lewis, Tony Skinn and Will Thomas. *UPDATE: Tony Skinn will not be playing for Team D.C. He will be representing Nigeria in the Olympics in London as their starting point guard after they beat the Dominican Republic for the final spot on July 8th. Funeral arrangements have been made for Philadelphia Police Officer Brian Lorenzo, who was killed Sunday morning in a head-on crash on I-95. A viewing will be held for Officer Lorenzo on Thursday evening at Givnish Funeral Home, 10975 Academy Road in Northeast Philadelphia. The funeral mass will take place Friday at 11 a.m. at the Cathedral Basilica of Saints Peter and Paul in Center City. The Fraternal Order of Police Philadelphia Lodge 5 has set up an account for Officer Lorenzo’s family at the Police and Fire Federal Credit Union in the name: “Brian Lorenzo Memorial Fund.” Donations for his family can be made at any PFFCU branch or other PFFCU members can make transfers directly by phone at 215-931-0300. They have identified the man behind the wheel as John Leck Jr. He was drunk and driving the wrong way on I-95 north around 3:15 a.m., when his sedan smashed into the Highway Patrol motorcycle Officer Lorenzo was riding. Funeral arrangements have been set for a Cumberland County officer killed in a car crash while on duty Sunday morning in Millville, NJ. A memorial service for Officer Christopher Reeves will be Friday from 10 a.m. to 1 p.m. at Lakeside Middle School and the burial will follow at Mt. Pleasant Cemetery. The Millville Policeman’s Benevolent Association Local #213 set up a fund for Officer Reeves’ son. Donations can be sent to “Officer Christopher Reeves Fund” at P.O. Box 1142 , Millville, N.J. 08332. Officer Reeves was killed when a car being pursued by police collided with his patrol car. Twenty-three-year-old Timothy Seidel was driving that vehicle and is in the hospital and police custody. A South Jersey Man met more than he bargained for Monday running with the bulls along the streets of Pamplona, Spain. 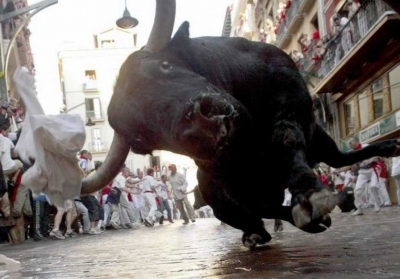 Aryeh Deutsch, 38, an engineer from Cherry Hill who has participated in dozens of bull runs at Pamplona, said he tripped and fell amid a crowd of runners as he dashed ahead of the black bull and saw the animal heading toward him as he lay on the ground. "The next thing I know I am underneath him, I can see his belly and I was trying to roll out of the way to get under the fence and yeah he got me, he got me in the right calf," Deutsch said. Deutsch didn't realize at first he had been gored but eventually said the hole in his pants and blood. He was taken by stretcher to a hospital were he was treated for a puncture wound. He has run here 53 times since 2004, and vows not to let this injury stop him from running again on Tuesday. Tonight, Mostly Cloudy with temperatures in the low 80's for most of the evening in Philadelphia.